Eastern Gateway Community College will host Dr. Ricardo Zambito as a guest speaker on April 15. Zambito will address students in the college’s Dental Assisting Program. He is slated to discuss innovative dental equipment, before and after patient cases, and student performance during the interview process. In addition to his many accomplishments, his wide range of knowledge in the field has led him to perform lectures and demonstrations for other dentists across the nation. College administrators said his willingness to share his knowledge and experience will provide keen insight into the field for EGCC’s aspiring dental assistants. Zambito is an avid promoter of the college’s dental program. He has been instrumental in spreading the word about EGCC’s program and has hired EGCC alumni to work with him. EGCC administrators said they’re excited to have Zambito come to the campus to teach dental assistants what it takes to succeed in the dentistry world. He is a staff member at Wheeling Hospital and Ohio Valley Medical Center, as well as a consulting dentist at Bishop Hodges Continuous Care Center and Home of Good Shepherd. He has proven his excellence in the field through his extensive training and ability to perform various types of procedures. 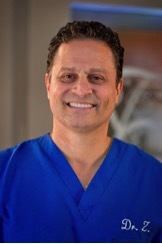 He received his Doctor of Dental Surgery degree from the West Virginia University School of Dentistry and has since received additional certifications and training in the areas of laser dentistry, implants, CAD CAM Cerec dentistry and Botox. Zambito is a member of the Wheeling Area Chamber of Commerce and holds several professional society memberships including the American Dental Association, Academy of General Dentistry, Wheeling Dental Society and America’s Top Dentists.